If you are interested in making more sales, then this page is going to be very important to your future sales success. Ever wondered why some salespeople make many more sales than you? I mean you work hard, you know your product, you know the benefits of your product for your customer, you’re punctual, you dress well, you make sales calls, you prepare for those sales calls yet someone out there seems to be making a lot more sales than you? You see it's all about the language they use. And what is really funny is these other salespeople that are making all the sales probably don't realize exactly what they're saying. They just learned by trial and error over the years OR they were lucky enough to stumble on effective sales language. You see it's not your fault. You either haven't been selling for long enough, or you haven't had a sales mentor to work with or you haven't been lucky. But I'm here to tell you that effective sales language can be learned and learned quickly too. Imagine talking to a prospect and having them react positively to everything you say. Just imagine being able to structure what you say in such a way that you can control what is in the mind of your prospect. How much will that increase the likelihood of them buying from you? I was in sales for 22 years. Sold everything from little knives for use in tanneries to anti-counterfeiting devices used in banknotes. In the early days, I just went out and asked questions and presented offers to people. That worked some of the time. But there were times that it didn't. Eventually I started to learn there were certain words that were more likely to make the sale than others. Then I became very interested in the language that successful salespeople used. I studied it. I searched out books that wrote about the language of sales. I listened to expert salespeople. I spoke to successful salespeople whenever I could to uncover what specific language they used to make sales. After about 18 years of doing that, maybe I'm qualified to offer suggestions on what language makes sales? How to control what your customer is thinking. How to describe your offer so they really get it. How to help them forget your opposition's offer. How to make sure they remember what you are offering. How to build their interest in your product. How to build a powerful “Yes set” without getting caught. How to get them to just accept what you are saying without needing to argue about it. How to hold their attention magnetically. How to use voice intonation to your advantage. How to subtly command a prospect to do your bidding. Your prospect will never realize what is happening. After a while you'll just do it automatically. How Important is Language in Sales? Napoleon said, “We rule men with words”. Do you really doubt that words can have a powerful influence over people? You only have to look at the presidential elections in the USA.Like his politics or not President Barack Obama's election was in no small way due to his ability to use words. I mean what's it worth to you to be able to control what is in the mind of your prospects? What's it worth to you to be able to get prospects to believe what you want them to believe? What's it worth to be able to make more sales? It cost me hundreds of dollars to attend seminars and buy resources to learn these techniques. But now you can get laser-guided accurate information like this - SPECIFICALLY relating to sales. This isn't some boiler-plate collection of answers. Everything is explained in PLAIN English. Which means it's dead-easy to read and understand. That's right, a fraction of what it's really worth and what it cost me to put this together. Why would I make it so affordable? Simply because my costs to deliver it to you are so low. $9.97 is a drop in the ocean compared to what you could make by using these secrets. You're discovering the secrets behind making sales to people who in the past seemed distant, unresponsive and like cold-fish. Plus because this is material for helping in your business, it's tax deductible! Hey, you're my customer. And if you're not happy, it looks bad on me. So if you're not happy with what you discover in "Sales Language" I don't expect ... or want ... to keep your money. Just simply whip off an email to me or contact me via the form on my website and I'll happily refund your money in full (in fact, I'd be embarrassed to keep it). But... the book is yours to keep no matter what, as a "thank you" gift from me! Okay? So you really can't lose! The information is yours no matter what. You may notice that the terms of the credit card merchant say "product refundable for 60 days". That's their terms and conditions. They hold a certain amount of my sales dollars to pay for possible refunds and obviously can't hold them forever, so they set a time limit. My conscience does not have a 60 day time limit though. So, if you are not happy don't hesitate to contact me and I'll make it right for you. You'll get a free copy of, "The Criteria Report". This report will explain how to understand what's most important to your prospect. After all talking with persuasive language does you no good at all if you do not know what your prospect wants. You need to be able to focus on what's important to them to build their desire to purchase. It's about talking in a way that motivates your prospects to ACT. 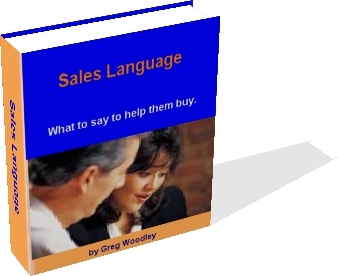 Couple this with the Sales language in this course and it’s a very powerful combination. You need to use this material ethically. Remember in “Spider Man” how it came back to haunt Peter Parker when he didn’t do the right thing and stop the robber? Well, if you use this information to sell people things they do not want, it WILL come back to haunt you. How Will You Get It ? Well the Book is available as a pdf download. Which means you can access it instantly. When you click on the link below you'll be taken to a secure order page with one of the leading credit providers on the Internet. You'll be asked for your credit card details or Paypal details. If you start to have second thoughts…….STOP……..
AND just keep in mind how many more sales you'll make in the next year due to Your new found ability with language. Then compare how much that will profit you to the small asking price of this e-Book. P.S. This information is everything you need to talk your way into more sales. So if that's what you want to do, this is the opportunity you've been waiting for.